These filters are ideal for removing liquid and solid contaminates, such as water, oil, and particulates, from air, inert, and reactive gas streams. They are an excellent choice for purifying gas streams containing corrosive components. These filters fitted with a Type K fluorocarbon resin element are particularly suited for use in gas streams where highly reactive gases are being analyzed, since these elements exhibit very low levels of adsorption. Housing are constructed without welds of 316L stainless steel. 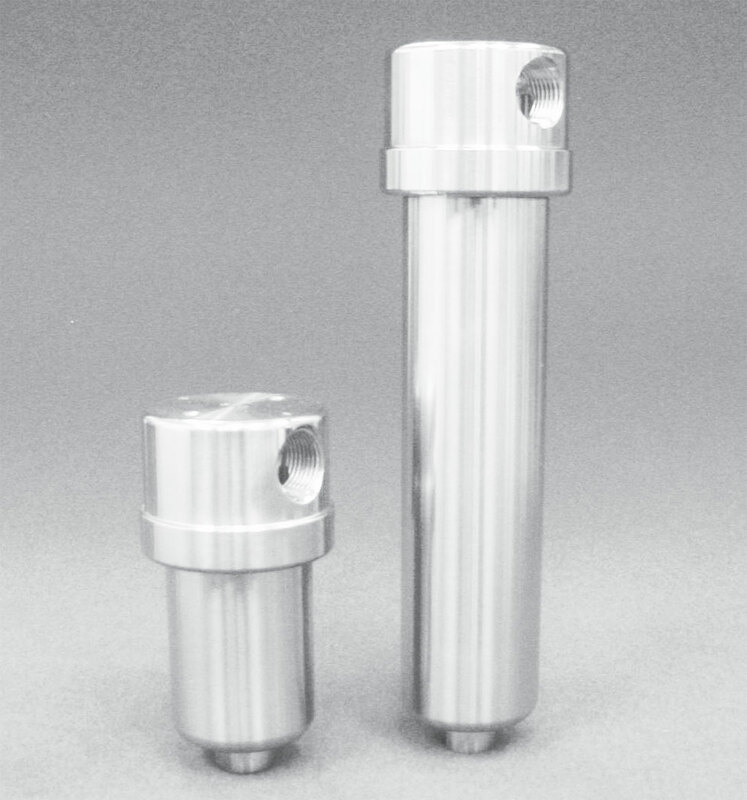 They are available with porting of 1/4” NPT female and 1/2” NPT female. Coalescer Type 70K: These elements have an efficiency rating of 95% against 0.1 micron particles and aerosols. They are a good choice for general purpose applications requiring clean compressed gas. Coalescer Type 50K: These elements have an efficiency rating of 99.99% against 0.1 micron particles and aerosols and should be used for the most demanding applications requiring a high quality clean gas. For the best performance, a Type 70K element should be used as a pre-filter to the 50K. Stainless Steel Type 01: These elements are constructed of sintered stainless steel or stainless steel mesh. They are especially useful in highly contaminated gas streams as they may be cleaned and reused. They are available in filtering efficiencies of 1, 10, 25 and 100 microns. Complete removal of solid and liquid contaminates from gas streams. Selection of non-reactive or stainless steel filter elements.